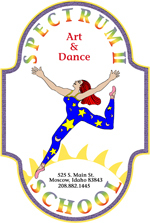 Spectrum II Art and Dance School offers classes in Art & Design, Ballet, Creative Dance, Modern Dance, Ecstatic Dance, and Tap Dance. All classes are currently taught by Shelly Werner whose passion for dance continues to deepen as she enters her 28th year of teaching. Shelly holds a Bachelor's degree in Dance and is completing a Master's degree in Dance Pedagogy from the University of Idaho. Shelly recently received 2006 volunteer of the year at Moscow's Good Samaritan Village where she has been teaching movement activities for three years in the Special Care Unit, working with patients with dementia.